The year was 1994. There had been a youth theatre previously at Bristol Old Vic – but it was very small, not integrated with the rest of the company and had been closed down a year earlier due to lack of funding. Sally Cookson and I were both actors in the ensemble company at the time and passionate about ensuring that theatre was accessible to young people. I knew how being involved in Youth Theatre as a young person had completely changed my life, not just in terms of learning to act, but also in my confidence, self-esteem, ability to communicate and understand the world as well as the human condition. We wanted to give that experience to a new generation. Sally and I put together a proposal for the then Artistic Director Andy Hay to run a new Youth Theatre, placing it at the heart of the company’s work. Andy and the Associate Director Ian Hastings were incredibly supportive, agreeing to finish rehearsals with the professional actors and companies at a certain time so that we could run sessions for young people in the rehearsal room. Since it was 1994, there was no internet to speak of. I remember photocopying hundreds of flyers on thin card and posting them off to all the schools across Bristol. We decided to run 6 sessions over 3 evenings split into age ranges between 5 and 23. It was no time at all before all 150 places were filled with young people from all over Bristol. Sally and I delivered 3 sessions each a week. Every term, we chose a different area of theatre practice to explore with all the groups – Stanislavsky, Brecht, Shakespeare, physical theatre, contemporary classics, etc, and every term there was a showing of work. I remember the first term, each group worked on an adaptation of a book as we explored the basics of storytelling. Every year, each member took part in a full-scale production, either a period or contemporary classic or a specially commissioned new piece of work. The first, All’s Well Behind The Curtain, devised by Sally, myself and the company, involved all 150 members and celebrated the history of The Theatre Royal from 1766 and the beginnings of Bristol Old Vic in 1945. One member, Nick Hunt, was able to portray his grandfather, Hugh Hunt, who was the first Artistic Director of Bristol Old Vic. The Youth Theatre went from strength to strength during those early years, expanding to around 300 members as we put in extra sessions on Saturday mornings and activities for associate members with Angie Hunt and Toby Hulse coming on board as workshop leaders. 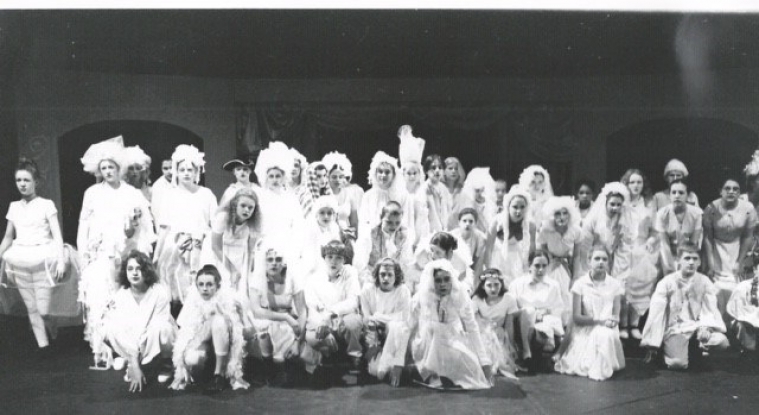 Part of its success was that the young people were able to see professional theatre close at hand and, through the ensemble nature, develop a great respect for each other, the audience, the professionals and the craft. I am thrilled to see how the Youth Theatre, now renamed the Young Company, has thrived in the intervening years since I left in 2004. I am in awe of everything it has and still is achieving. Directing the Youth Theatre was a privilege, always. The young people who participated came with such incredible creativity, openness and talent – breathing a life force into King Street. A large number of members over the years have gone on to work in the arts as actors, directors, designers, technicians, producers and it has given me great pleasure to work professionally with some of them. Many more have gone on to other areas of work. But hopefully all of them will have taken with them into adult life a sense of their own worth, a compassion and understanding of others and a desire to make the world a better place through their experiences at Bristol Old Vic.